Clear Lake Area Panhellenic President Jill Reason, right, and hostess Cathy Osoria prepare to welcome the crowd to the Fall Friendship Tea. 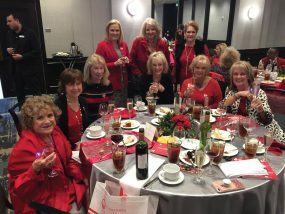 BAY AREA social calendars are filling up fast these days with Clear Lake Area Panhellenic and Houston Symphony League Bay Area kicking off the season with their annual welcome parties. 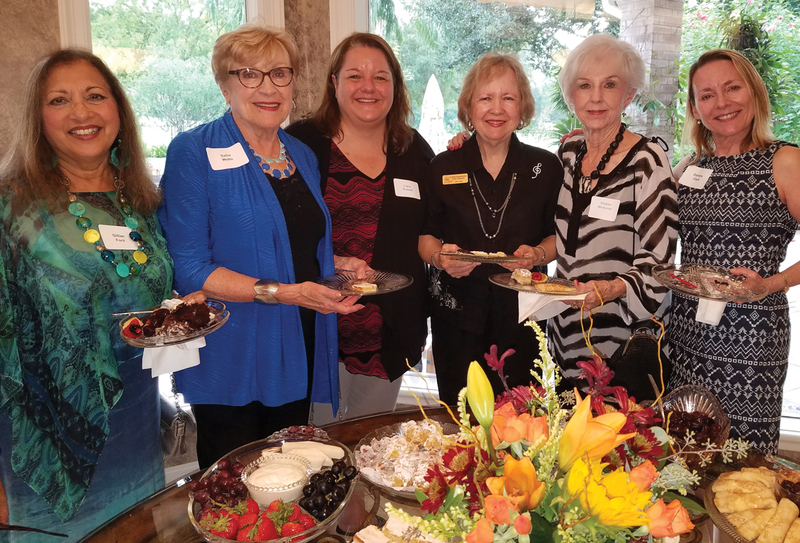 Clear Lake Panhellenic members filled Cathy Osaria’s Bay Oaks home to overflowing for their annual Fall Friendship Tea – catching up on each other’s news and planning the year ahead after a warm welcome from President Jill Reason and Chairman Jo Nell Hunter. Looking over the crowd, you probably would have spotted Karen Weber, Michelle Richardson, Kelsey Richardson, Ondi Lyon, Jo Cat Bruce, Lisa O’Brian, Ruth Beecher, Emmeline Dodd, Sue Broughton, Sue Ellen Jennings, Holly Williamson and Kay Lee Benoit among the early arrivals. Wasn’t long before they were joined by Belva Dewey, here from Baton Rouge, Diane Overman, Ann Gay, Laurie Vaughn, Judie Ferguson, Ellen King, Annette Dwyer, Darla McKitrick and dozens and dozens more. Tracey Webb, dressed up as a jockey, even brought her son’s small horse to add to the merriment. One of the afternoon’s highlights came as Fall Fashion Show Chairman D’Lisa Johnston announced the Kentucky Derby theme for Panhellenic’s big luncheon Friday, Nov. 4 at South Shore Harbour Resort. Instead of the Run for the Roses, it will be the “32nd annual Run for Scholarships,” as profits from the event provide scholarships for area graduates and funds to help local students attending Girls State. To date, Panhellenic has provided scholarships totaling more than $500,000 with profits from its events. There were smiles aplenty as the Houston Symphony League Bay Area hosted its annual Wine and Cheese Party, including those of Gillian Ford, Sallie Watts, Liana Russell, Cindy Kuenneke, Sisbee Winburne and Darlene Clark, from left, as they lined up for refreshments. 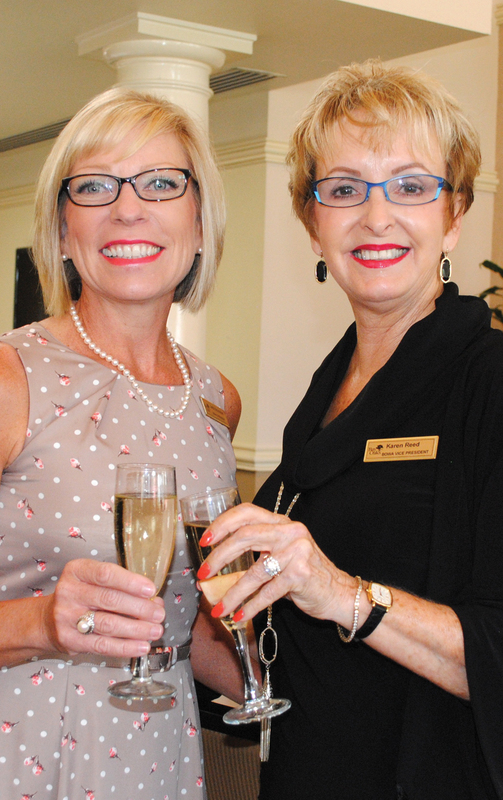 HOUSTON SYMPHONY League Bay Area members launched the 2016-17 season with their annual Wine and Cheese Party to welcome new and prospective members. Hostess Angie Weinman wore a big, warm smile as she joined Chairman Carolyn Murphy in greeting the arriving crowd that included Mary Ann Shallberg, Gillian Ford, Sallie Watts, Liana Russell, Cindy Kuenneke, Sisbee Winburne and Darlene Clark. Dr. Patrick McKinney was there, chatting with President Mary Voigt and Vice President Jim Moore and his wife, Aggie, at the Weinmans’ Bay Oaks home in Clear Lake. Looking around, you might also have spotted Pat Biddle, Carol Wilson, Sandra Strickhouser and Martha McWilliam, to name a few. 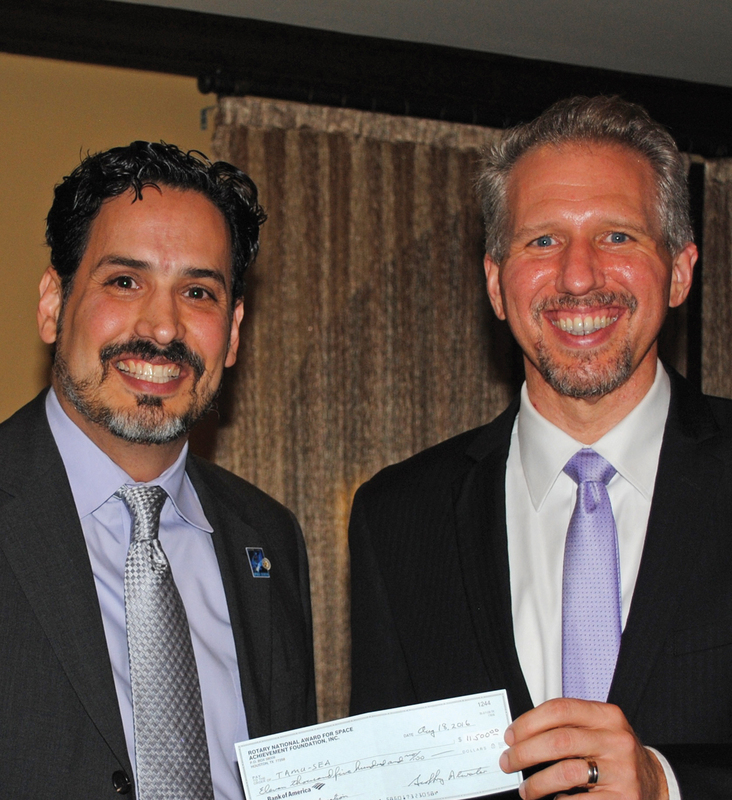 RNASA President Rodolfo Gonzalez, left, presents Mark Wright a check for $11,500 for the Texas Aerospace Scholars Program during Appreciation Dinner. THE ROTARY National Award for Space Achievement Foundation celebrated another successful Space Gala with RNASA President Rodolfo Gonzalez presenting a check for $11,500 to Mark Wright for the Texas Aerospace Scholars Program at its annual Appreciation Dinner at Landry’s Seafood Restaurant in Kemah. Another $10,000 from the gala profits was presented to the Caltech Summer Undergraduate Research Fellowships Program in the name of this year’s gala honoree, Dr. Charles Elachi. “I’m delighted that RNASA is making a generous donation on my behalf to the Research Fellowship Program, which enables a new generation of space explorers to work on research projects with seasoned mentors,” said Elachi, who recently retired as director of NASA’s Jet Propulsion Lab and is professor emeritus at Caltech. 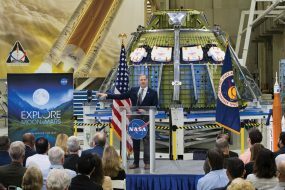 Special guests included retired Johnson Space Center Director Mike Coats, Lorna Onizuka of the Challenger family, retired Rockwell President Dr. Glynn Lunney and his wife, Marilyn, and former RNASA President Floyd Bennett and his wife, Carolyn. Some of the others joining them in the celebration were Vivian and Geoff Atwater, Lauran Rochon, Karen and Gary Johnson, Debbie and Tim Kropp, Jordis and Bob Wren, Kippy Caraway, Delia Stephens, Susan and Bill Taylor, Frank Perez and Priscilla Ennis, Jean Walker and Mark Hollis. Fashion Show Chairman Karen Reed, right, receives congratulations from Bay Area Women’s Association President Jodie Schnabel on another successful event. 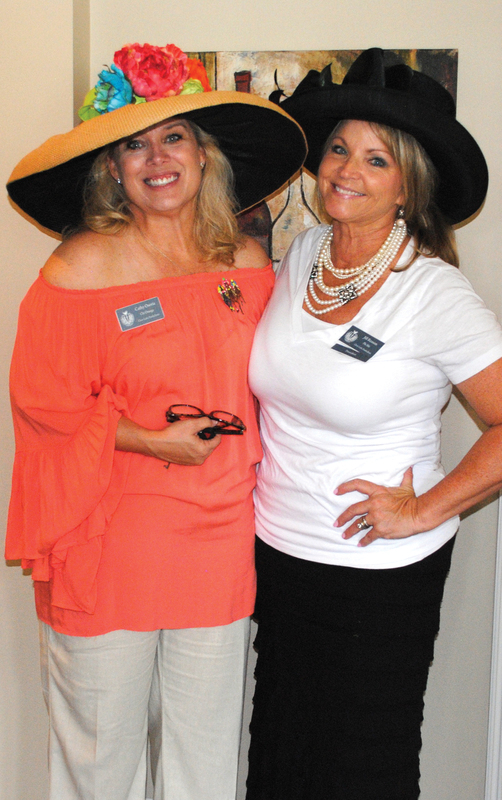 BAY OAKS Women’s Association members were out in force the other day when BOWA kicked off the season with its popular Fall Fashion Show, featuring the latest styles from Sandy Carney’s The Clotheshorse in League City. Rest assured, she did not disappoint, sending Angela Bivens, Mary Colombo, Susan Franklin, Tencha Heimlich, Sue Ellen Jennings, Elaine Rister, Jodi Schnabel, Amy Schweers, Dee Wolfe and Cindy Zook down the runway in an array of beautiful outfits. Much to the delight of Jackie Daley, Sandy Lantz, Ann Brady, Eileen Hult, Yvonne Perrin, Carlene Langford, Glenna Crist, Norma Ogletree, Ruth Beecher, Joan Wade, Mary Smith, Traci Dvorak, Judie Ferguson, Janice Gornto, Kathy Costanza and Chairman Karen Reed. 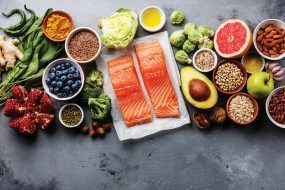 They were among dozens who oo’d and aa’d including Pam Ploss, Emmeline Dodd, Carol Bobo, Gloria Wong, Rita Armstrong, Angela Swint, Tencha Heimlich, Priss Fletcher, Ann Dooley, Sue Broughton, Janet Greenwood, Sarita Singh, Sharon Phelps, Diane Konick, Georgia Piwonka and Rebecca Richey. « Are you ready for prime fishing time on the water?